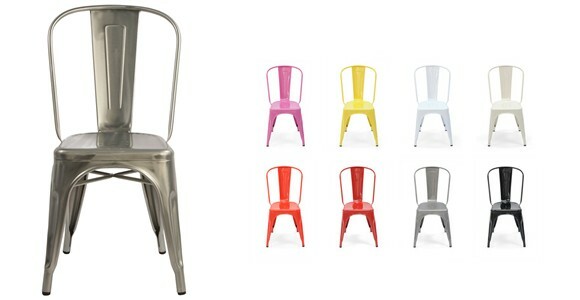 The Tolix style chair is the metal chair that seems to be taking over the hospitality sector by storm these days. It is a design that I am seeing more and more frequently, but one that I always get excited about seeing, regardless. I am forever jumping up and down (literally) when I spot one and continuously point them out to my family and friends! The original chair was designed by furniture design “hero” Xavier Pauchard (1880-1948) in 1934. 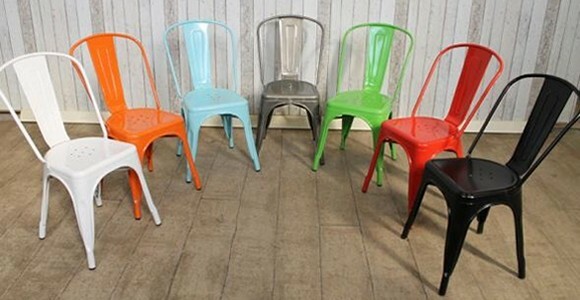 The chairs became a favourite very quickly for use in cafes and retro kitchens and the same still stands today. They are immediately identifiable and they are even used on the Coronation Street set for Nick’s Bistro. The design and style originated from Pauchard realising that metal could be protected from rusting by dipping it into molten zinc or by galvanising it. This process made them ideal for outdoor use, especially with holes in seats where rain could drain through. The pioneer of galvanisation registered the trademark TOLIX in 1927 and the manufacturing of them increased with further distribution to hospitals and breweries. The galvanising process made the chairs more hygienic than wood, which was the favourable material for furniture, this was at the time due to the pieces being easier to clean. The popularity of the chair with café owners increased by the time the Pauchard was succeeded by his son Jean. Seeing the need to keep with the demand of café owners, the design of the original TOLIX chair was tweaked slightly to allow for stacking capabilities and by the late 1950s the factory had an estimated 80 workers producing around 60,000 units annually. Remaining in the Pauchard family until 2004, the chair is now part of the collections of MoMA, New York, the Pomidou Centre in Paris and the Vitra Design Collection in Weil am Rhein, Germany. The revival has been put down to Chantal Androit and the modern chair designs are now available in several different colours, adapting to an ever increasing demand for the marvellous design. Half of the TOLIX annual turnover is through export, alone of which half is to the USA. This shows that the popularity of the chair has even reached overseas! In 2006, TOLIX received the label “A Lining Heritage Enterprise” by the Ministry of Economics, Finance and Industry and it is not difficult to see why! 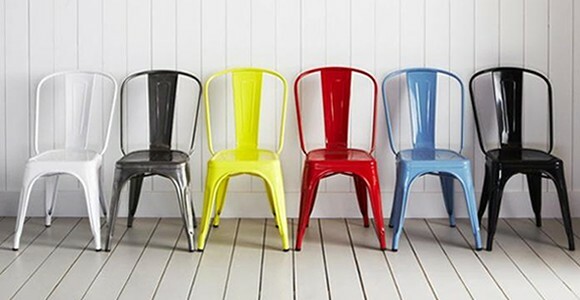 These days, with the “loft look” being a lot of café and restaurant owners’ favourite style of choice, the TOLIX style chair is still taking over the interior design World. An everlasting masterpiece that, I am sure, will continue to impress for many more decades to come!